This issue contrasts genteel Camp cricket with conditions at the Front where the first draft are sleeping rough within sight of the big guns; there have been casualties. July 1915 – An open-air gymnasium has been added to the Camp near the bayonet practice area (between the West Car Park and Westminster Pond). Cricket in the evening after drills is very popular. In mid July a week of heavy wind and rain played havoc so tents have been abandoned – the recreation hut has become a large hostel at night time. The third draft have been warned to be in readiness to depart for the Front. On Saturday, July 24th there was a 12 mile route march in full kit and ready for active service. On Monday, July 26th the Chaplain Rev. Dickinson conducted a special service. Next day a large company of civilians gave the draft of 60 men a hearty send-off. The Regimental Band played inspiring music as the men marched briskly to be entrained at Ampthill Midland Station. 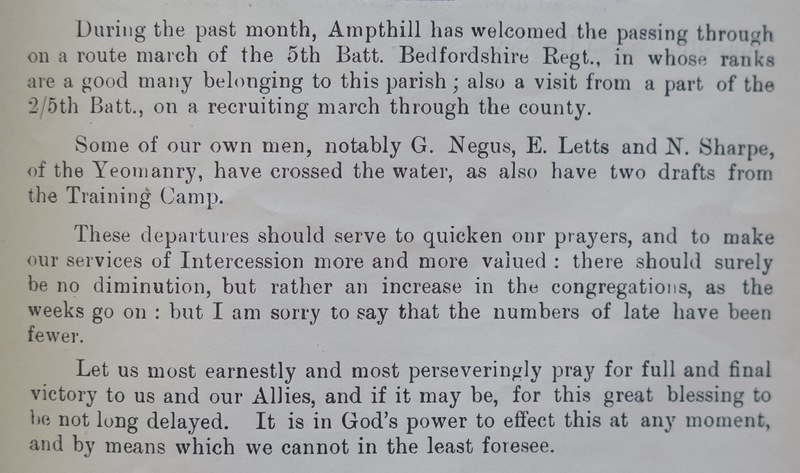 News from the Front – letters are being received from men who left the Camp last month. Corporal Hart is the first of the draft to get wounded [June 16]. He writes of being shot in the first engagement, charging the German line. Platoon commander Lieutenant Turnbull was killed in a crater alongside. His body has not been found. 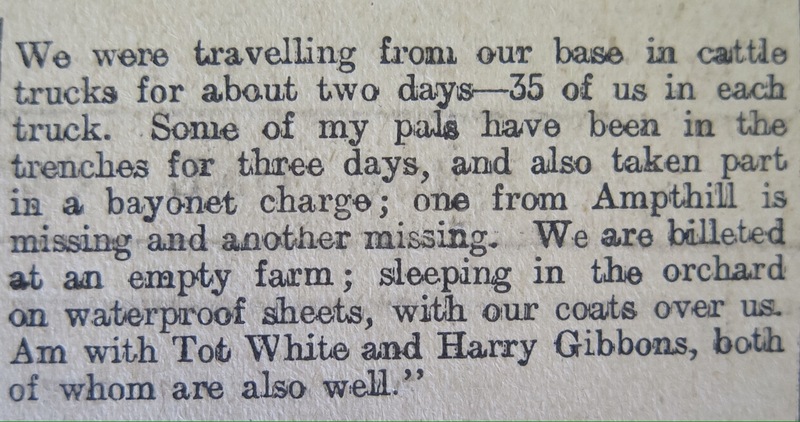 George Willsher says that he is billeted with Thomas ‘Tot’ White and Harry Gibbons in the orchard of an empty farm which is within sight of the Front. The big guns flash when they are fired. Some of his pals have been in the trenches for three days, and have also taken part in a bayonet charge. One Ampthill boy is missing. What became of the men who are named in the Bedfordshire Standard? Private 17875 William Hart of Leighton Buzzard – was shot on 16 June 1915 attacking a German trench. He recovered but was injured again in 1916 fighting with the Bedfordshire Regiment 2nd Battalion and died from his wounds on 15 October. His grave is in Heilly Station Cemetery, Mericourt-L’Abbe. Private Hart is remembered on the War Memorial in Ampthill Park. Second Lieutenant Laurence Turnbull – was killed on 16 June 1915 as his platoon [inc Private Hart] attacked the German line. 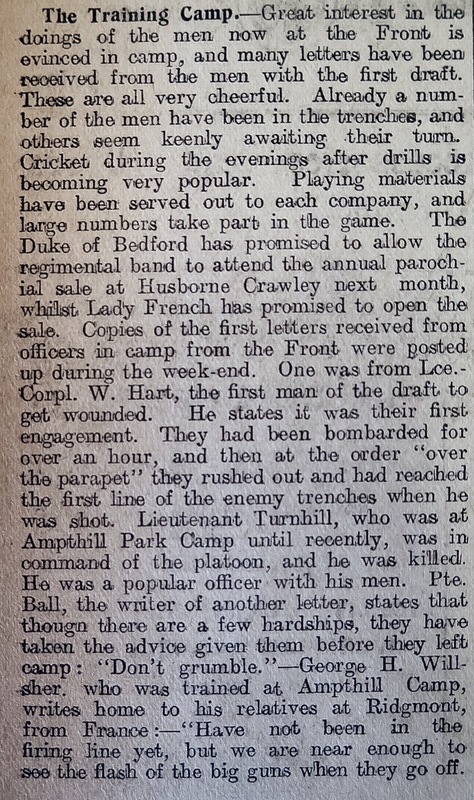 The death was recorded on 18 June in the Bedfordshire Regiment 2nd Battalion Diary. Lieutenant Turnbull has no known grave but is remembered on the Le Touret Memorial to the missing and on the War Memorial in Ampthill Park. Private 17743 Harry Gibbons of Steppingley – was killed in action on 27 September 1918 fighting with Bedfordshire Regiment 4th Battalion. The 4th Battalion Diary entry for 28 September indicates that Corporal Gibbons was engaged with the objective of capturing the Hiddenburg Support Line. His grave is in Moeuvres Communal Cemetery in France. Corporal Gibbons is remembered on the War Memorial in Ampthill Park and on a plaque in the church of St. Lawrence, Steppingley. Woburn Abbey has published more about the story of Harry Gibbons. Banner of Faith (which contains the Parish Magazines for 1915). Next installment to be published on 1 March 2016…. This entry was posted in Camp Diary, Uncategorized and tagged 17743, 17875, 1914-18, Ampthill, Ampthill Park, Bedfordshire Regiment, Bedfordshire Training Depot, Camp Diary, Duke of Bedford, Great War, Harry Gibbons, Laurence Turnbull, War Memorial, William Hart, Woburn, WWI on February 15, 2016 by Ste H.